Nitriding is a case hardening process which nitrogen atoms are introduced into the surface of the work piece. 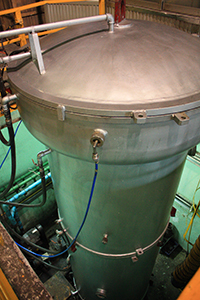 Nitriding causes nitride compounds at the surface, in the surface and in the distance which nitrogen diffuses. Work piece with nitride layer at the surface and nitride particles below surface will get better properties such as higher surface hardness, better wear resistance, higher fatigue strength, better corrosion resistance, least distortion and better hot hardness. Lonitriding is the latest technology of nitriding process which NH3 will be ionized to N+ and introduced into the surface of specimen that causes the higher efficiency. lonitriding furnaces at B.K.J are bell type (for small parts), cylinder type (for long parts with 3.5 meter available) and horizontal type (for general shape parts).